I have a confession to make, one I am not proud of. I cheated. I have always had a strong sense of who I am and can resist temptation easily. I have never had a problem with infidelity, until now. It didn’t last long. I know that doesn’t make it better, but I somehow thought it might mean less, it wouldn’t cause as much pain or guilt. How is a girl supposed to say “no” to something so beautiful, so hot, so inviting? It’s like all of my senses suddenly became alive after months of a dry spell. The smell, the sight, the feeling of this forbidden stranger under my fingertips. It was more than I was prepared to deal with. I know it sounds like an excuse, but I was not physically able to restrain myself. It was something deep inside me, something that said “I must have you.” So I did. I had hoped that my moment of weakness would not affect me later. I wanted to give in to my temptation and then leave it there in that beautiful moment. I didn’t want the feelings, the memories, or the guilt to creep into my days to follow. I wish that were the case. This morning I feel dirty. I feel like there is a bowling ball in my stomach and my veins are filled with lead. My head is foggy and my skin is crawling, I can feel it burning. It no longer burns with desire, it burns with disgust and disappointment. The burning is actually visible, my skin glows red, little splotchy reminders of my embarrassment, weakness, and mistake. The worst part of all? My fiance watched it happen. In his eyes I saw worry, not anger. All he wants is for me to be happy, so he was willing to watch the infidelity happen right in front of him. He knew what would happen. He knew that a few minutes of pleasure would lead to pain, and oh how right he was. But he just wanted me to be happy. I try to live my life free from regret, so today I will not focus on my shortcomings. Instead I will focus on what I can learn from this experience. The next time I decide to cheat, I will be smarter about it. The next time I break my gluten-free, vegan, tomato-free diet, I will not violently eat three huge slices of NY style pizza in under 3 minutes. I will at least try to ingest something that doesn’t contain all three of my “no no foods” into one. One beautiful, steaming, dripping, delicious slice of heaven. I will not soon forget you. Neither will my angry skin or stomach. You kept me till the end! Great writing! Hilarious. I have a post sitting in my drafts about caffiene and cheating. It just feels so dirty sometimes! Are you off of caffeine? I have been too for I guess about 6 months now, I’ve FINALLY gotten to the point where I don’t miss it. It’s taken forever! Haha! Great post! I knew you were talking about food right for the beginning, but I love the analogy! I read with careful anticipation and a little smirk on my face the whole way through! I hope you recover from your infidelity very quickly! I figured some people would definitely know this wasn’t my actual (fiance) cheating confession 🙂 Funny how you can “know me” without really “knowing me”…does that make sense? haha! I guess we all have our binge moments from time to time. p.s. the next time you need pizza check out Amy’s. she has an amazing vegan gluten free pizza. I had no idea Amy’s had a vegan pizza, very cool! I love all of Amy’s meals. When I was eating dairy, the gluten free Mac and Cheese was my go to. It is amaaaazing. Thanks for the suggestion! I think we are definitely kindred pizza spirits. Does the restaurant Mellow Mushroom exist where you live?? If not, you are very lucky. It is the most unreal, melt in your mouth, most delicious pizza I’ve ever had in my life. Just thinking it about me now is making my mouth water. My fiance and I frequent there and the last few times I’ve been good and haven’t eaten any! Don’t tell anyone but I think his intense love for pizza as well makes me love him more. Thank you for the support, haha! I seriously need it. I will be sure to shoot you a message next time I’m thinking about going to the dark (delicious) side. Loved this post. As a few people have already said, I can’t think of anything better to cheat with than a pizza. Couldn’t.agree.more. It’s just so…perfect. I literally had to tell myself “NO” when I went back to get a FOURTH piece. The only thing that really stopped me was my fiance saying “Court you ate my lunch for tomorrow. You said you were only going to eat one piece and you ate half the pizza.” Whoops. This got a good LOL out of me! Especially that your fiancé was watching it happen haha! Pizza is so bad…so bad. I like to think that I can cheat too, actually almost did today with pizza as well. But knowing I could go into labor at any minute I decided against it since the last think I need is that awful gas and stomach cramps when I’m pushing out a baby! Haha TMI!?! HAHA I know I was wondering what you and the other fam members would think while reading it. Although obviously you would know I hadn’t actually cheated on Ike. Pretty sure you’d be the first one I’d call screaming “WHAT HAVE I DONE, I CHEATED ON THE ONLY MAN WHO WILL EVER PUT UP WITH MY ALLERGIES, SLEEPWALKING, GENERAL MANNERISMS, ANXIETY, AND MY INCESSANT BARKING AT HIM!” Yes, actual barking. Constantly. We’re working on it. I heart your silly face. Very well put together, lady! I kept waiting for you to throw something like that out there, and you did! YAY! Sorry about all your splotchy skin and yucky belly. It was TOTALLY worth it right up until the yuck, huh? Belly and skin are feeling better, so now the guilt has lifted a bit. Thanks!! I need you to know that this was a beautifully written post. I’ve only ever cheated (like on a partner) once, when I was in Highschool. This post back those memories and the feelings…. Then when I got to the end, I could relate even better to the cheating on my diet…. LOL It was perfect and made me laugh so hard! 😀 Thank you for that. Ugh, you must feel miserable today! Pizza is really hard to resist though. 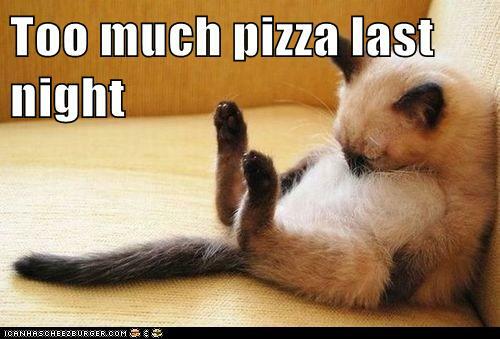 I sometimes have nightmares where I forget that I have Celiac and accidentally eat pizza LOL. I hope you feel better soon! LOl pizza nightmares, nooooo!! Does gluten free pizza do it for you, or is it just not the same? I’ve always wanted to try it but GF pizza always has egg! Now, now, don’t be too hard on yourself. If you’re going to cheat you might as well do it with three huge slices of NY style pizza. Is there anything better to cheat with? I have to agree! The only thing that would come close is a big juicy cheeseburger smothered in cheddar cheese topped with tomatoes, lettuce, onion, mustard, ketchup. Throw it between a potato roll and I’m in heaven. Now I’m salivating. Me too. What are you doing to me?